Public meetings last week saw growing support for an action group fighting the construction of a 22-turbine wind farm at Heckington Fen. ‘Heck Off’ - as it is being called - held a well-attended public meeting last Tuesday in the Hume Arms at South Kyme to explain to concerned residents the latest position in which developers Ecotricity are seeking to amend their current permission for a wind farm on land at Heckington Fen. The company has requested permission to increase the length of the blades of the turbines from 90m to 103m, although not increasing the 125m height of each turbine. The company is also pressing for a relaxation of planning conditions to go ahead with ground works while a solution is found for interference with radar. A second public meeting was held at Hubberts Bridge on Thursday. Chairman of the group Melvin Grosvenor said the latest amendments to the blade lengths of the turbines are ‘significant’ and would have a greater impact on surrounding residents from rotor noise. Mr Grosvenor said they will be calling for more time to respond and will not rest until the matter is looked at again. 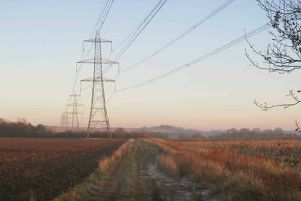 An Ecotricity spokesman said: “Independent consultants (Hoare Lea) have carried out a comprehensive revised noise assessment that showed that no significant effects would occur in relation to noise, as the original assessment also demonstrated. He said the variation could reduce the number of turbines needed to 18, thereby reducing the scale of the development.